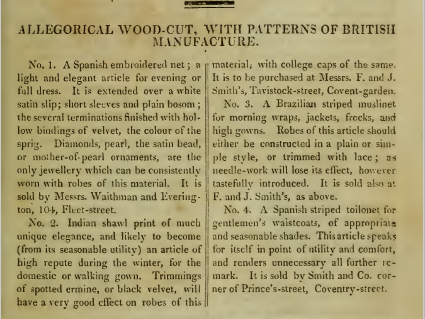 The “Patterns of British Manufacture” in the back of December’s issue also focus on mourning dress, with fabric samples appropriate for full and “second” mourning. Arbiter Elegantiarum returns this month to wax fearful about the “influence that the love of dress has upon the inhabitants of country towns and villages.” AE urges “landowners, and proprietors of estates, to check as much as possible” the “ruinous propensity” of the less-than-genteel to mimic the fashions of their betters. 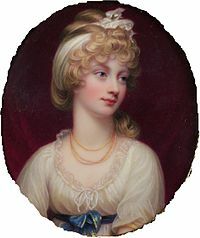 Interesting to consider whether many Regency-era landlords in fact had enough sway over their tenants and other employees to dictate what they could and could not wear. And whether the wives of said landowners played any part in such regulation. 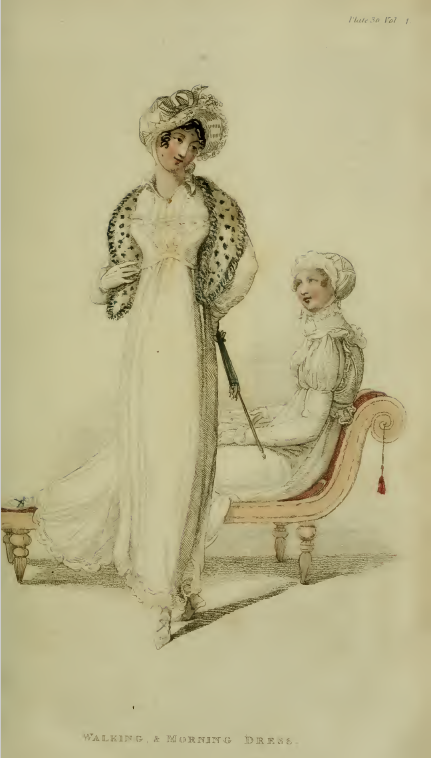 Can you imagine going off to police your “dependents” while wearing that “French tippet of leopard silk shag” that the lady in Plate #30 is sporting? 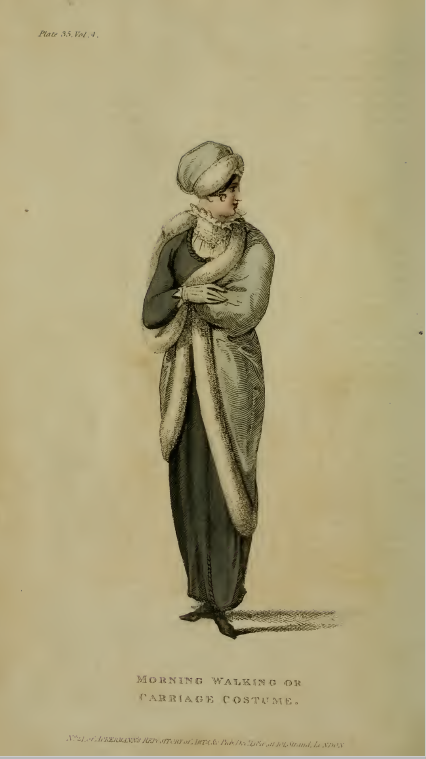 In earlier days, AE notes, it was easy to tell who was a gentleman: “one descended from three degrees of gentry, both on the mother’s and father’s side.” In contrast, during AE’s times, a gentleman is “any one who possesses a certain sum of money in the funds, though his father be a scavenger or a chimney-sweeper.” AE shares the fears of many a genteel person of the period, fears that the once strict boundary lines between the classes has become frighteningly permeable. I wish we had more of the sample of #1 fabric, a “Spanish embroidered net”; it appears that part of the swatch has been ripped away, alas. Brown and rose are one of my favorite color combinations. Not too enamored of the Indian shawl print (swatch #2); perhaps it would be more attractive in a larger sample? 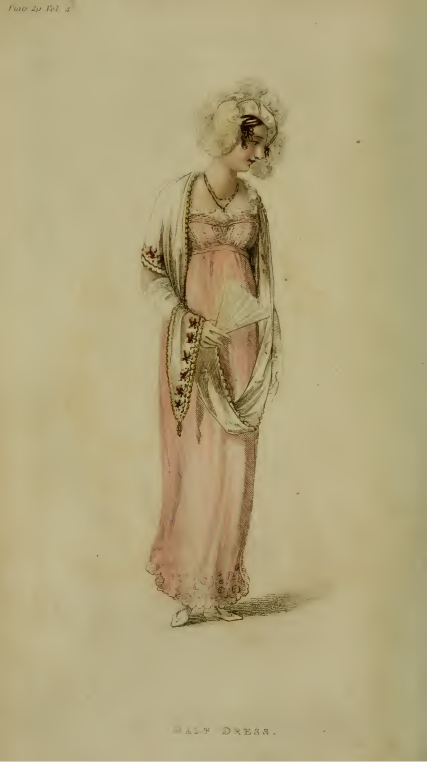 October seems an odd time for frolicking on the English shore, but one of this month’s fashion plates is labeled “Promenade, or Sea-Beach Costume.” The other is equally unusual: not just a “Morning Dress,” but a “Morning Dress, or Costume a la Devotion,” which I’m taking to mean “at prayers” or “at devotions,” given the background portrayed in the print. 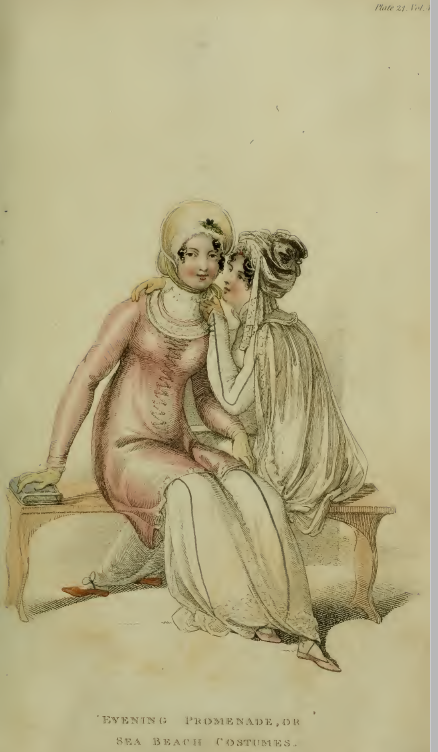 A young Regency woman of fashion can gossip with her friends, but she should also spend time communing with the Lord. Polka dots? Big, yellow polka dots with bright red centers? On your drawing room curtains and sofa? 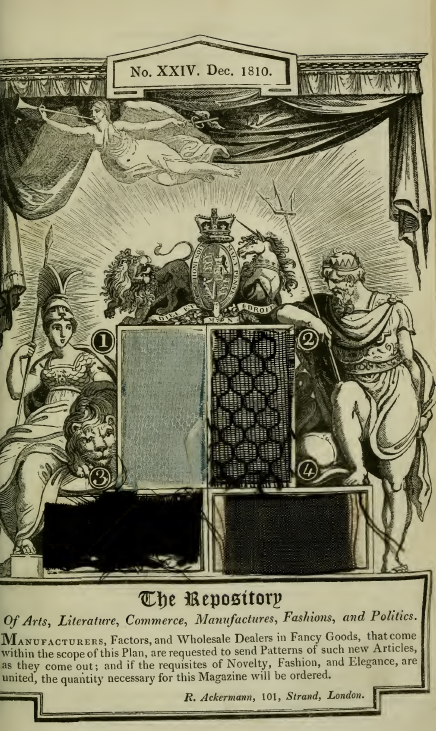 Hard to imagine this “most lively and appropriate furniture print” on anything from the Regency era, doesn’t it? 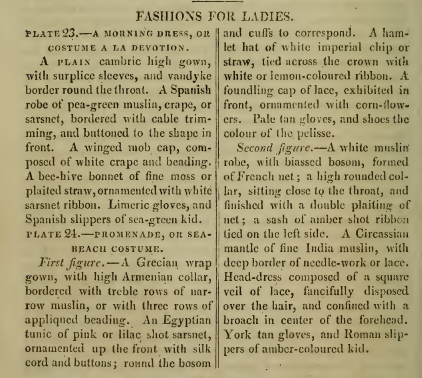 No commentary from Arbiter Elegantiarum in September, just descriptions of one Full Dress gown and two Promenade Costumes. 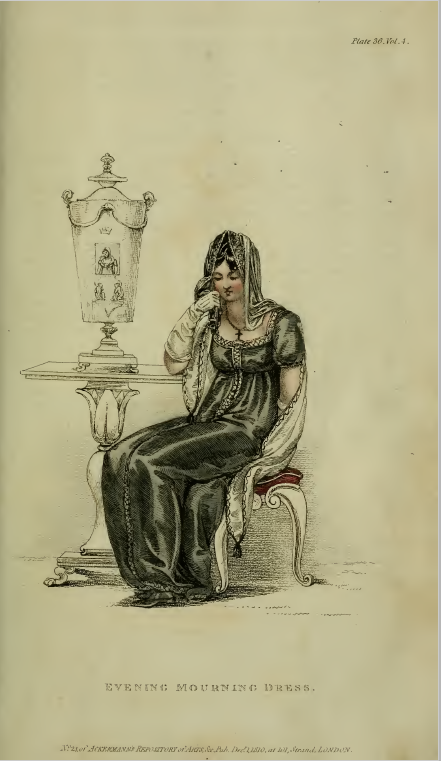 I’m struck by the lace-up fronts of two of the dresses (described as a”stomacher front” in the first plate, and “bosom of the robe laced with white silk cord”); this style isn’t seen very often in Regency-set films. Perhaps because it is associated more with earlier periods’ styles? Unless I’m misreading, the “neck-chain and cross” around the first lady’s neck is reported as being of “dead gold filigree.” Anyone have any idea of what “dead gold” is? I’m taken by the unusual shapes on the “Indian shawl cambric” of this month’s fabric sample #3, and can imagine it making a lovely dress. 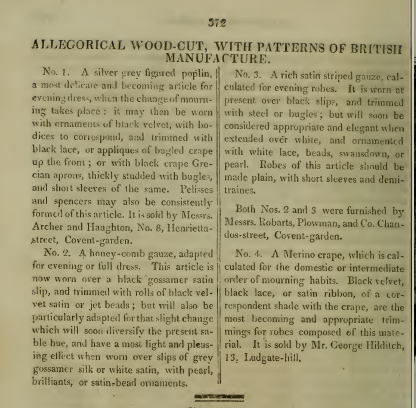 Alas, Ackermann’s says “this article exclusively belongs to the simple order of domestic costume. 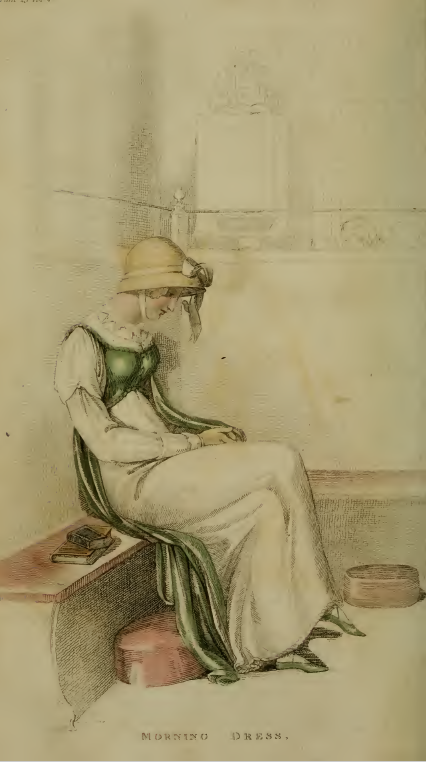 It is sometimes seen in the high morning robe, but is better adapted to the embroidered shirt and foundling cap of the same, which most agreeably relieve it.” I was having a hard time picturing this fabric as a baby’s cap; good thing I had C. Willett Cunnington’s English Women’s Clothing in the Nineteenth Century to remind me that adult women sometimes wore “foundling caps” as part of morning dress (see illustration below). 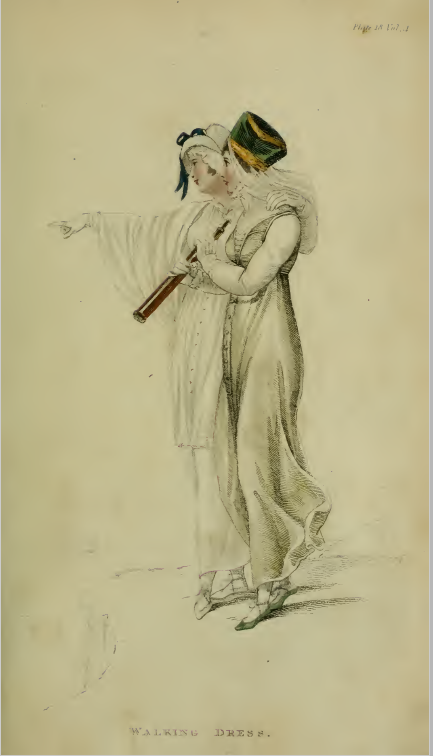 While putting together my Ackermann’s fashion plate posts last month, I came across several pages of drawings in the June 1810 edition of the journal. 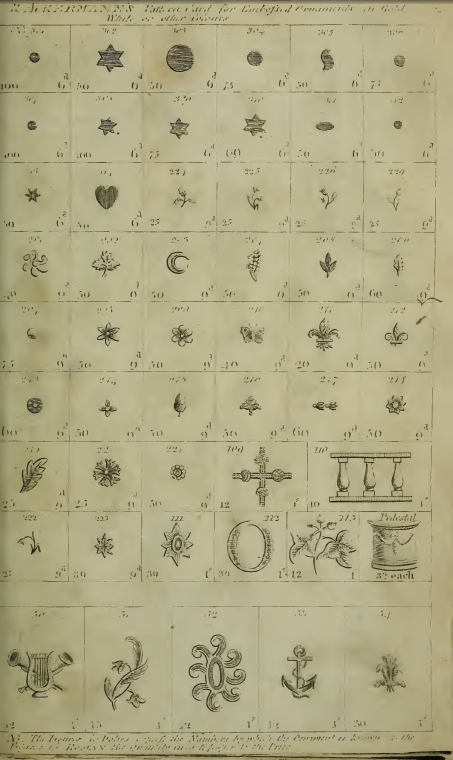 I thought they might be designs for period type ornaments, something that I’m always on the lookout for, so I screen-shot them and then set them aside for my files. 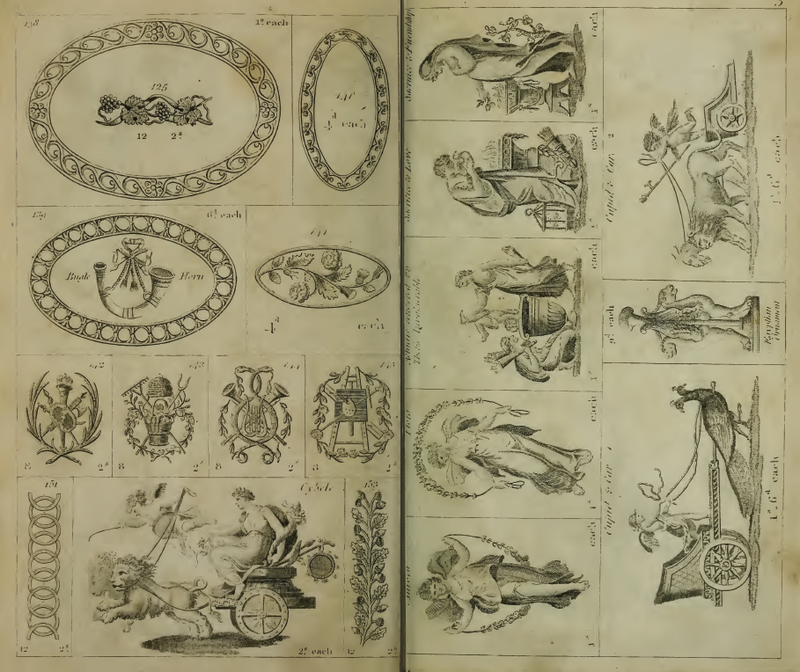 What the heck are “Embossed Ornaments,” I wondered, and what in the world did stylish Regency readers use them for? Jewelry? Trim for gowns or coats? A bit more research was clearly required. 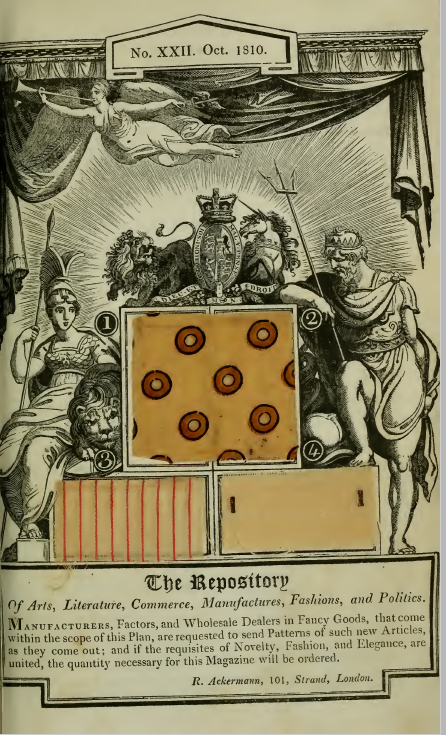 Thank heavens for Google Books. 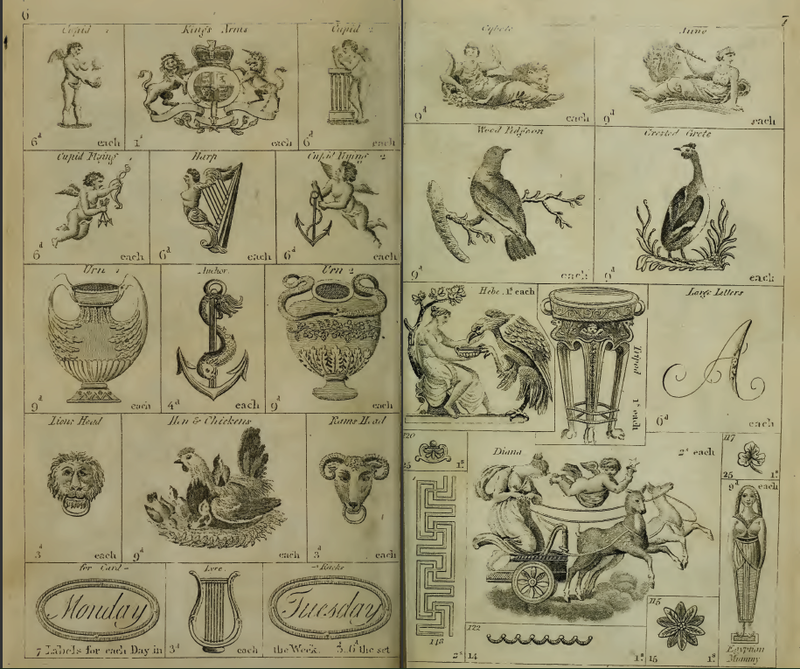 A search using “Ackermann’s pattern card embossed ornaments” lead me to Maurice Rickards’s fascinating Encyclopedia of Ephemera: A Guide to the Fragmentary Documents of Everyday Life for the Collector, Curator and Historian (Routledge, 2000). 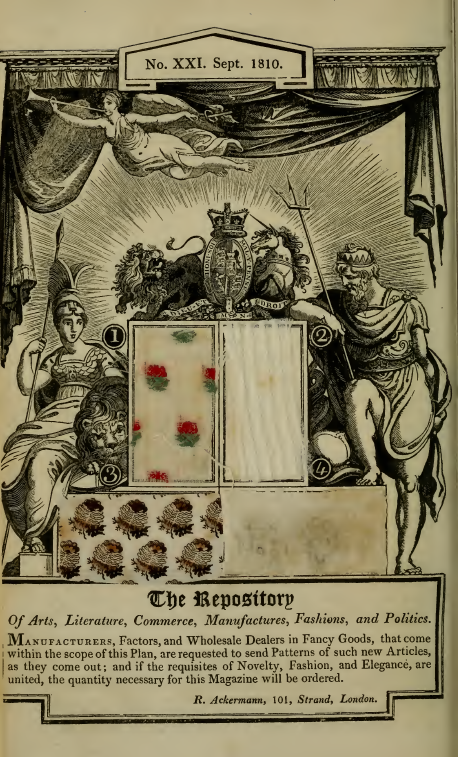 This 550-entry alphabetically organized encyclopedia focuses on manuscript and printed ephemera in English dating from the 1500s to the present day. 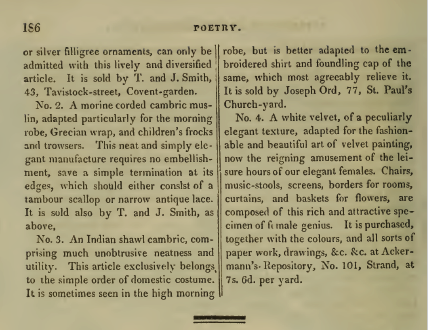 Information about “embossed ornaments” shows up in the Encyclopedia‘s entry for “Tinsel print” (see page 383), not a connection I would have made on my own. 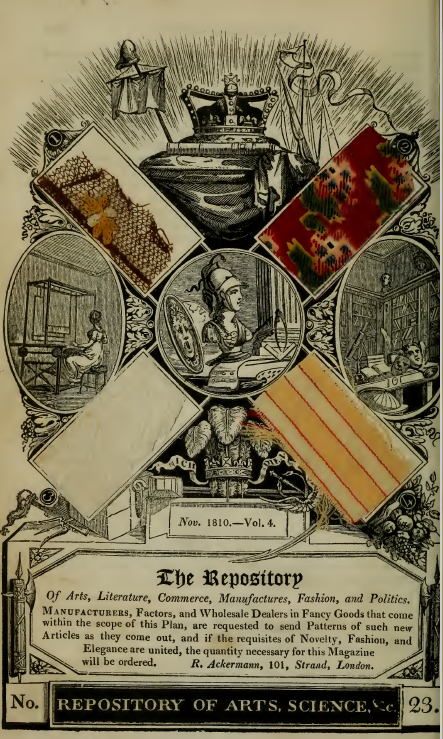 A tinsel print, according to Rickards, is “a hand-coloured print embossed with metallic foil and other materials.” Taking up the idea from the 17th-century French vogue of decorating prints with additional material, early 19th century London toy theatre creators used tinsel to decorate their cut-out figures, “a deluxe version of their ‘tuppence coloured’ products.” Rickards reports that in addition to toy theatre makers, “many toy shops and stationers also sold ready-made addenda—breastplates, plumes, helmets, swords, jeweled necklets, etc., cut out and requiring only to be glued on to figures.” He goes on to list Ackermann and H. J. Webb as purveyors of tinsel-print materials, specifically referencing the Ackermann’s pattern cards “for Embossed Ornaments in Gold, White or Other Colors” which I came across in the June 1810 issue. 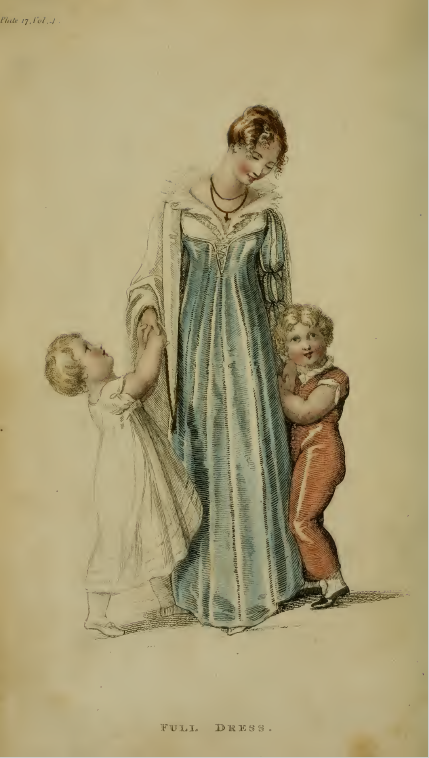 These illustrations, though, don’t seem intended for ornamenting toy theatre figures. 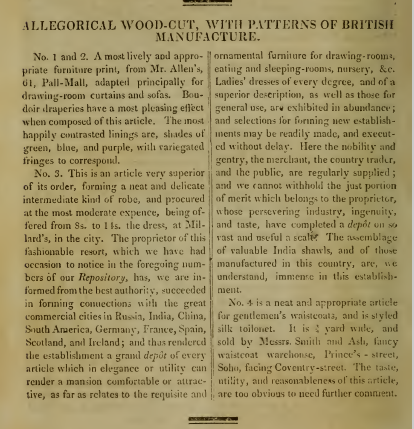 Only after figuring this out did I realize that the article that followed the Pattern Card illustrations, “Observations on Fancy-Work, As Affording An Agreeable Occupation for Ladies,” was connected to them. 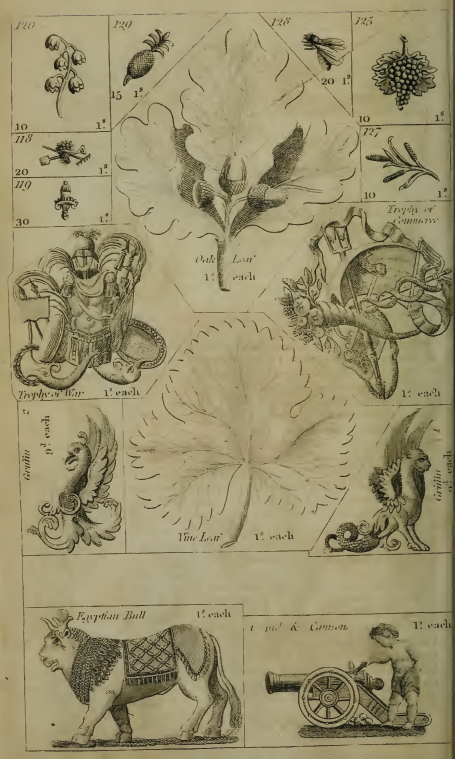 The article mentions ladies who “have been led by genius or example to acquire the art of painting,” and who use said art to decorate “vases, fire-screens, hand-screens, flower stands, boxes, and other articles (XVIII.iii, page 397). 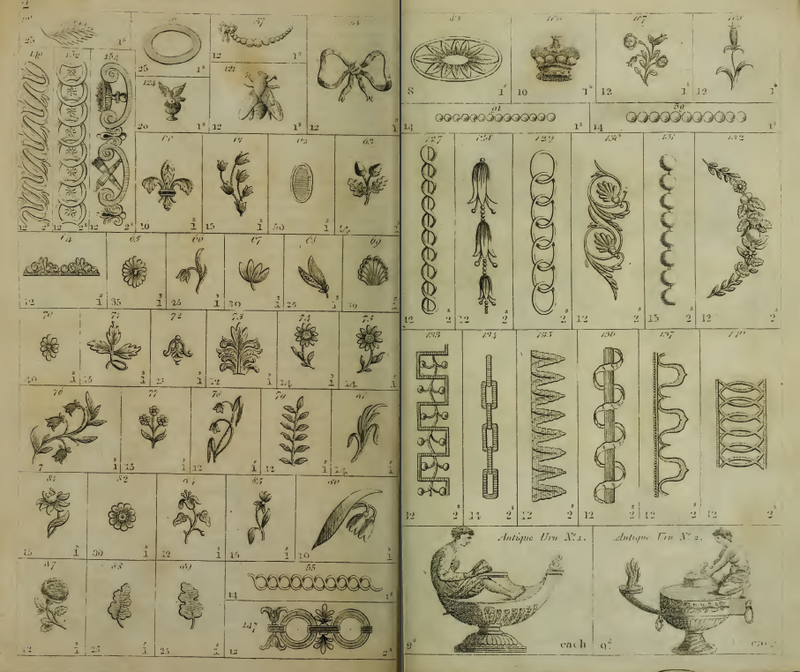 But even “those females who have not made themselves mistresses of the art of managing the pencil” can still participate in such decorative embellishment: by using embossed ornaments, conveniently available at Ackermann’s! I wonder: would Mr. Darcy lump embossing in with the other “common extent of accomplishments” such as painting tables, and covering screens, and netting purses? Or would it not even rate that high?